Here is a full and fascinating account of that coming together. 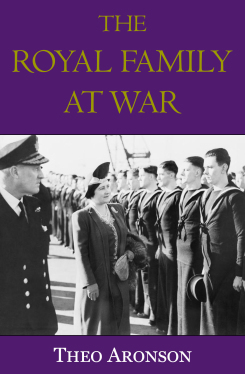 It is a study of the contribution made, not only by George VI and his redoubtable Queen, but also by the entire royal family during those turbulent years. And of how that contribution strengthened and popularized the monarchy. This is a family saga; an account of the lives, as much private as public, of all the diverse members of what George VI called 'The Firm'. Together with the tireless efforts of the King and Queen, it deals with such aspects as the Duke of Windsor's flirtation with Fascism, the ground-clearing obsessions of Queen Mary, the mysterious death of the Duke of Kent, the activities of the Athlones in Canada and the Gloucesters in Australia, and the imprisonment of the Princess Royal's eldest son, Viscount Lascelles. Occasionally tragic, often amusing, always interesting, it is a richly detailed panorama of the monarchy in one of its finest hours. Theo Aronson has been granted an unprecedented series of audiences with the Queen Mother, Princess Margaret, Princess Alice. Duchess of Gloucester, and the late Princess Alice, Countess of Athlone, as well as interviews with many other members of the royal family and of the royal households. He has been permitted the use of previously unpublished letters, diaries and papers. The result is a colourful study by an author who has been consistently praised for his insight, scholarship and, above all, readability.